Backs up the DELPHYS UPS, overcoming the constraints, risks, costs and hazards of batteries. The solution inverter DELPHYS with dynamic storage of energy VSS+ DC was carried out by SOCOMEC UPS. VSS+ DC uses a very high-speed, rotating flywheel.The rotating assembly is held up by maintenance-free electromagnetic levitation, with no contact with other parts. 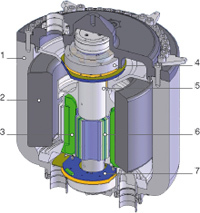 A maintenance-free internal system vacuum eliminates friction and maximizes energy efficiency. The flywheel-driven generator supplies energy to the UPS during a power failure, thus providing continuous power to the load. When mains power is restored, the flywheel takes less than 5 minutes to return to full speed. 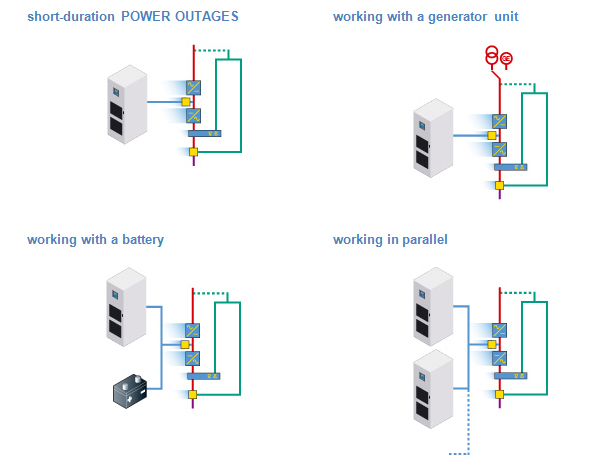 THE VARIOUS CONFIGURATIONS Various solutions or combinations for meeting your requirements for electrical energy availability are possible depending on your operating constraints and technical environment. 1. short-duration POWER OUTAGES The VSS+ DC system is connected to the DC bus; it supplies the inverter when the low-voltage system exceeds the voltage tolerances. Thereby providing 99.5% protection against system failures. 2. working with a generator unit The VSS + DC supplies the inverter long enough for an emergency generator to take over the power supply and rapidly recharge the VSS + DC. 3. working with a battery When connected in parallel with a battery bank, the VSS+ DC cuts in during all short power failures and voltage sags; battery backup is used only for long duration cuts (or not at all if a backup generator is present). Battery life is extended by very infrequent demands. 4. working in parallel VSS+ DC units connected in parallel increase power and available backup time. No communications hardware or software needed, this capability is built-in. 200 kVA/160 kW: 17 sec*. 160 kVA/128 kW: 21 sec*. 120 kVA/96 kW: 27 sec. 100 kVA/80 kW: 33 sec. 80 kVA/64 kW: 40 sec. 60 kVA/48 kW: 50 sec.